Jacks under 20’s Coach Howard Tweets said Saturday’s opponents are playing well and the league table doesn’t lie. “By right and with merit Bayswater sit top of the 20’s league currently and will arrive at the final with confidence,” he said. Tweets said they head into the game as underdogs in many peoples eye’s but he confident his young side can get the job done. “Being lower on the ladder will in many eyes promote Bayswater as favourites for success, which will suit us not having to live up to that expectation,” he explained. Whatever happens on Saturday Tweets and his assistant Mike Fisher said they already winners. “If they control their emotion for the day and individually deliver solid performances we will be competitive and have every chance of causing an upset,” he said. The last word a coach say’s to his players before the game is important, especially on Cup-Final day and Tweets said there will be content on the day that’s exclusive for the dressing room, but he will give the players confidence and tell them to go out and shine. “Openly, the instruction will contain a message around play with no inhibitions, give all you can in passion, energy and intensity,” he said. From everyone at the club good look to Howard, Mike and the players, and if you can get along and support the young Jacks and lets bring home the trophy – ‘The Pride of the North’. 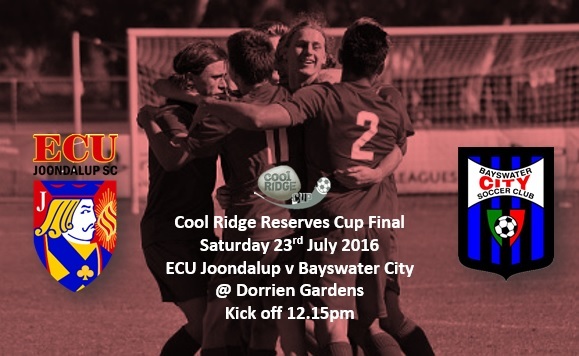 – Kick off is 12.45pm at Dorrien Gardens the home of Perth Soccer Club.